911uk.com - Porsche Forum : View topic - Who's got a golden rod, or RS linkage, or both? 911uk.com Forum Index > 993 (1993 - 1998) > Who's got a golden rod, or RS linkage, or both? Just picked mine up after install of GR & SSK both from FDM. That's how it's supposed to feel! I'd say the GR is a better upgrade than the SSK, but I like both. Would def recommend doing GR. Love it. I bought the GR first, love the feel of it, much more precise and mechanical in feel. Sort of clickity click if that makes any sense. The SSK was fitted this week and I collected it a couple of hours ago. What a difference. Less sloppy, more accurate. Obviously a shorter throw too but oddly that's not what you notice. Combined these two are a superb and very noticable upgrade. No idea why 9m can't fit one without cutting/modifying? I suspect whoever gave that advice was thinking about an AWD car and not understanding the differences? It fits perfectly. Great to hear tyinsky . Looking forward to getting mine back now. Good point Nick. It is a lot better for being higher. No idea why 9m can't fit one without cutting/modifying? I suspect whoever gave that advice was thinking about an AWD car and not understanding the differences? Would be very worried if these guys couldn't tell a 2WD from AWD whilst the former was on their ramps. Well something isn't right is it? FDM must have sold plenty of them. I was under my car while mine was being fitted and there is not one place it grounds on anything. All I can imagine is someone there was either thinking about the AWD car (as the old kit did ground on the AWD) or has fitted one without reading the instructions. I've got plenty of photos of it with the cover off showing fitted in place and will put them on my blog with a decent review as it is a great mod. Well something isn't right is it? Its interesting to hear that all fits well on your car. But, if I could explain in the 2nd person. Let us say you had agreed with a reputable garage to fit the solid rod to your car. Having owned the car for a while, you clearly know your car is 2WD, as does the garage, since they had worked on it before and they are a specialist outfit. You are given an agreed price in writing of £330 +vat, being consistent with the said part and you send the car in. What would your thoughts be, when you turn up on collection day and they surprised you with a bill that is almost double that amount because they fitted the original part instead, without your approval, siting the reasons mentioned in the earlier posts for doing so ? Do remember they are a reputable specialist outfit and I trust they know what they are talking about. Whilst I can not control the thoughts of those who may read in between the lines and form a different opinion, I can at least lay claims to having an original part fitted. ...and a better gear shift than the standard rubbery one. 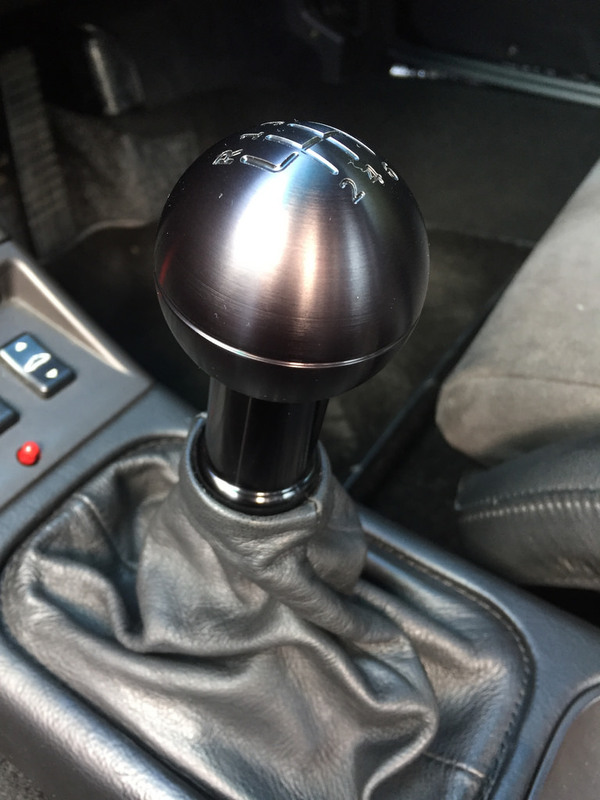 Haven't been out for a good drive in a few weeks, but headed to Precision Porsche for the Cars & Coffee Meet on Saturday morning and, with this thread in mind, instantly acknowledged the direct and exact Shifting that the GR and the SSK gives..
That, and my Function First CNC Shifter, and it feels like a Race Car..! Kingroon, your knob appears to have an unusually short shaft. What part is that? ..your knob appears to have an unusually short shaft.. Joke aside, it's a Function First Shifter..